Council’s Regulatory Services Department supervises and enforces statutory requirements under a number of acts, regulations, Codes of Practice and Local Laws. 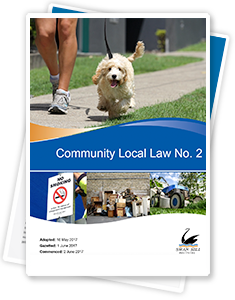 Council has adopted a number of local laws that aim to protect and enhance the community’s general way of life and wellbeing. Provides a safe and healthy environment where residents enjoy a quality of life that meets the general expectations of the community. Provide the administration of Council powers and duties.